Sandra Rendgen describes the history of “data” the word and where it stands in present day. All through the evolution of statistics through the 19th century, data was generated by humans, and the scientific methodology of measuring and recording data had been a constant topic of debate. This is not trivial, as the question of how data is generated also answers the question of whether and how it is capable of delivering a “true” (or at least “approximated”) representation of reality. The notion that data begins to exist when it is recorded by the machine completely obscures the role that human decisions play in its creation. Who decided which data to record, who programmed the cookie, who built the sensor? And more broadly – what is the specific relationship of any digital data set to reality? Oh, so there’s more to it than just singular versus plural. Imagine that. The Swedish biologist Carl Linnaeus (1707-1778) is well known in biology as the father of modern taxonomic nomenclature, although he is better known in his own country for writing a series of travel books that cataloged the cultures and resources of Sweden. * He was knighted in 1757, and took the noble name Carl von Linné, as well as adopting a coat of arms (shown below). This claim is repeated around the internet, almost always attributing the words directly to the man himself: Deus creavit, Linnaeus disposuit he liked to say (Smithsonian Institution); Deus creavit, Linnaeus disposuit he took as his motto (Harvard University); Deus creavit, Linnaeus disposuit was how Linnaeus himself summed up his lifetime achievements (Uppsala University; and Svenska Linnésällskapet — the Swedish Linnaean Society). The motto has been used both to mock him for his presumptuousness and to praise him for his piety. Primary references for this alleged motto are, however, conspicuously absent from any of the web sites, and our search of the literature, as well as consultation with Linné experts, have failed to present any evidence that he ever used this motto himself. In the standard Linné biography of Fries (1903), it is simply referred to as an "illuminating epigram which admiring contemporaries used" (see Jackson 1923), which does not explain how it came to be attributed to Linnaeus, nor where it come from. FV Hope (Anon. 1843) suspected it had originated as an act of malice. Although it has been used to that end by his adversaries, it was originally meant to express awe and admiration. The Life of Sir Charles Linnæus, Knight of the Swedish Order of the Polar Star, &c, &c.
As you can see, the motto is used as a banner situated directly below the coat of arms of Linné, and to all appearances is a part of it, with a portrait in profile above. This gives the impression that the words were coined by Linné himself (as was the case for the coat of arms). The frontispiece has the alleged motto flanking the coat of arms of Linnaeus, rather than being part of it. This makes all the difference to the interpretation. The portrait, incidentally, is a poor copper engraving, drawn from a plaster medallion by Inländer from 1773 (cf. Tullberg 1907). Das Motto unter dem Bildnisse Linné's [...] wird hoffentlich mit der Religiosität keines Lesers in Collision kommen. Es rührt von einem Manne her, der ein langer Freund des Vestorbnen war. Whoever devised it, it seems probable that this phrase is a post-Linnéan laudation communicated to Stöver orally or by letter. At any rate, it do not appear in print until 14 years after Linné's death. This may seem like a rather harmless "factoid", but it highlights how easily erroneous beliefs can be established, even in a scientific environment. This brings us to a second myth, a misconstruction of the very core of Linné's views on classification, which has seriously distorted how the development of 18th century systematics is perceived. The widely held picture of Linné as an Aristotelian Essentialist, classifying nature by Medieval Scholastic Principles of Logical Division, dates from the work of Cain (1958; see Winsor 2006), and was uncritically accepted by several influential authors, such as Mayr (1982) and Futuyma (1998). But this is like stating that Darwin was a creationist! On the contrary, the scholastic approach is strongly criticized by Linné. He was the first to clarify the conceptual difference between the top-down divisionis leges (which he claimed will by necessity result in artificial groupings and disruption of natural taxa) and synthetic systematization. Linné emphasized that natural taxa are not defined by characters but must be built from the basic entities (species) upwards (Linnaeus 1737). He was far ahead of his time in doing this. The misrepresentation of Linné's views by Cain's and his followers has been thoroughly debunked by, for example, Skvortsov (2002), Winsor (2006), Müller-Wille (2013) and others, but it seems to be hard to eradicate. A more amusing misunderstanding is the so-called flower clock, reputedly planted by Linné in the Hortus Academicus of Uppsala (now called Linnéträdgården, The Linné garden), about which numerous visitors and journalists ask each year. However, Linné's flower clock (1751) was a list of selected phenological observations, which never materialized in the Uppsala academic garden as an actual plantation, nor was it ever meant to. Attempts to plant flower clocks in gardens have shown that they are not very accurate as to general time-keeping across seasons and latitudes. It seems to be quite common in English to insist on the use of titles for British people but not for foreigners. As noted by Stöver and Trapp in their book, "Carl von Linné" is best treated as the Swedish equivalent of "Sir Carl Linnaeus". Cain AJ (1958) Logic and memory in Linnaeus' system of taxonomy. Proceedings of the Linnean Society of London 169: 144-163. Fries TM (1903) Linné. Lefnadsteckning, 2 vols. Stockholm. Futuyma DJ (1998) Evolutionary Biology, 3 edn. Sinauer Associates, Sunderland MA. Jackson BD (1923) Linnaeus. Abridged and adapted from Fries 1903. London. Linnaeus C (1737) Genera Plantarum. Conrad Wishoff, Leiden. Linnaeus C (1751) Philosophia Botanica. Godofr. Kiesewetter, Stockholm. Mayr E (1982) The Growth of Biological Thought. Harvard University Press, Cambridge MA. Müller-Wille S (2013) Systems and how Linnaeus looked at them in retrospect. Annals of Science 70: 305-317. Tullberg T (1907) Linnéporträtt. Aktiebolaget Ljus, Stockholm. Winsor MP (2006) Linnaeus' biology was not essentialist. Annals of the Missouri Botanical Garden 93: 2-7. * On May 18 we had Linnés trädgårdsfest, which is Uppsala's celebration of Linné's working life in the town. **According to Guido Grimm, a more literal translation would be: "It originates from an old friend of the deceased, who, being of rare noble character, summarized the widely accepted opinion(s) of experts". In 1939, John and Ruby Lomax traveled through ten southern states in three months. They recorded music by individuals with the belief that the subtleties of music culture is best captured when a person plays for another face-to-face. The Texas Folklore Society’s founding members shared with Lomax a sense that their state’s rich folklore needed to be documented and preserved for the analysis of later scholars. Nascent technology such as the radio and the gramophone, it was feared, would end the age-old tradition of transmitting music and lore directly from one person to the next. With professional musicians’ works being piped into homes across the country, the purity of traditional music, its particularities of region, religion and ethnicity, could be lost forever. 0000-0002-8715-2896 It was a turning point. The previous year, the US Civil Rights Act had passed. On 26 January 1969 in New Orleans, 17 African-American mathematicians gathered at the annual national mathematical meeting. We have had quite a few blog posts about the early metaphors used for genealogical (and other) relationships, whether they be for biology, linguistics or stemmatology. These early metaphors tended to be about trees, either in a literal sense or as a stick diagram of some sort, although we have tried to cover all of the early genealogical networks, as well. However, this situation does create some potential confusion, because the concept of a genealogical (or phylogentic) tree in the modern world is very much based on the mathematical concept of a tree, which is a graph-theoretical construction. This was clearly not the intention of most of the early authors, especially those writing before Arthur Cayley introduced the mathematical concept (in 1857). The mathematical version of a tree is a line graph, in which nodes are connected by edges. The edges must be directed if the graph is to represent evolutionary history (ie. the edges point away from the root); and it must be acyclic (or else a descendant could be its own ancestor). 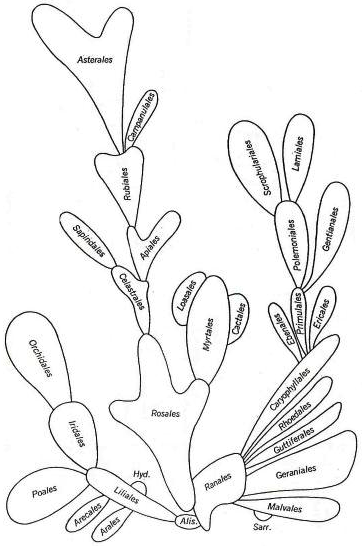 The leaf nodes are usually (observed) contemporary taxa, and the internal nodes are (inferred) ancestors. Note that this definition can be applied to both bifurcating trees and to reticulating networks. This construction is valuable for computational purposes, because we can construct a mathematically optimal tree, which biologists can then use as a starting point for representing the hypothesized genealogy. However, it is not necessarily valuable as a metaphor, which was the purpose of most of the early authors. There is thus a potential difficulty for modern reads to interpret the older diagrams; and it seems likely, in turn, that the authors of many of the older diagrams would be somewhat befuddled by the modern mathematical restrictions. Sometimes the metaphor and the mathematics will agree, and sometimes they won't. Tree thinking, time and topology: comments on the interpretation of tree diagrams in evolutionary / phylogenetic systematics. Cladistics 29: 315-327 (2013). Different from trees, more than metaphors: branching silhouettes — corals, cacti, and the oaks. Systematic Biology 66: 737-753 (2017). There has long been ambiguity in the use of the term tree in phylogenetic systematics, which is a continuous source of misinterpretation of evolutionary relationships. The basic problem is that while many trees with phylogenetic or evolutionary relevance ... are consistent with graph theory, tree-like visualization of phylogeny may also be done via other types of graphics, especially botanical (or literal) tree drawings. As a consequence, the meaning of such diagrams is not always clear: a given picture may have multiple interpretations in its different parts, and two figures that look similar may actually carry quite different information. Podani resolves the ambiguity by recognizing two fundamental characteristics that any tree diagram will contain: (1) it may show either ancestor-descendant relationships or sister-group relationships; and (2) a time order may be important or it may be disregarded. This leads to a 2x2 representation illustrating the four basic types of "trees" that have been used in phylogenetics. He gives the four types of branching silhouettes tongue-twisting, but appropriate, names. 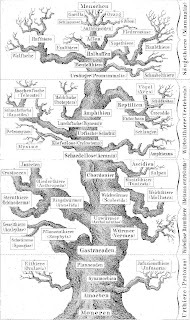 The diachronous diagrams are "classic" evolutionary trees with a time dimension, which thus have ancestors as internal nodes and contemporary organisms as the leaves. The achronous diagrams are similar, but they allow descendants to arise from contemporary taxa — they are thus the classic "grade" trees showing morphological advancement, which thus allow paraphyletic ancestral groups. The synchronous diagrams are the modern cladograms, with no observed ancestors (but maybe inferred ones at the internal nodes). The asynchronous diagrams are similar, but they can have ancestors as leaves (eg. "pattern" cladograms of ancestors and descendants together). Podani also gives these four branching silhouettes colloquial names. Charles Darwin is often credited with the tree metaphor, but in the Origin of Species he explicitly acknowledges predecessors, although he does not actually name them (see Naudin, Wallace and Darwin — the tree idea). In his own notebooks, his first metaphor is actually a coral (see Charles Darwin's unpublished tree sketches), and this is the name that Podani recommends for the classic evolutionary trees. He names the grade trees as cactus, named after the common epithet for the diagram used by Charles Bessey (in 1915) to illustrate plant relationships (see the image below). 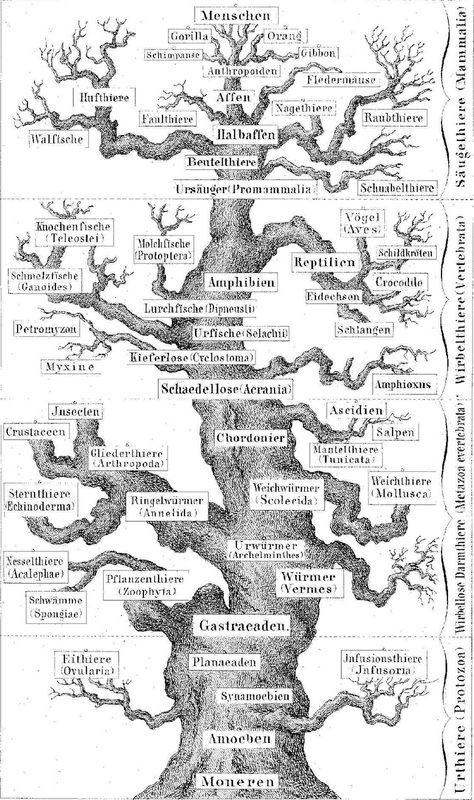 Furthermore, he recommends oak for the two variants of cladograms, as this is a common epithet for some of the diagrams drawn by Ernst Haeckel (see Who published the first phylogenetic tree?, plus the diagram at the top of this post). Finally, Podani's work does raise an interesting question. Modern (cladistic) methods of phylogenetics are designed to work with synchronous trees (ie. no observed ancestors). To what extent do these methods work if you try to put fossils into the dataset, which are potential ancestors? After all, this would make the result an asynchronous tree, instead of a synchronous one.